A greasy coating on the walls along the waterline of the pool is evidence that there is a saturation of undissolved materials in the water while a ring of rough patches may be a sign of scale. Most of the time, oils,lotions, and other organic contaminants that enter the water via swimmers cause the greasy buildup. Scale conditions are due to hard water problems or failure to correct water balance issues. Please visit the Scale troubleshooting section for more info on that problem. Add Pool Tonic™ to remove contaminants such as oils, lotions and grease. 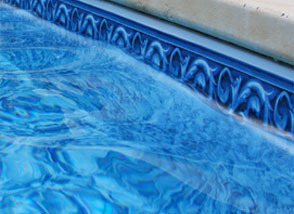 Add Scale Inhibitor to gradually remove scale from pool surfaces. Use a brush and Off The Wall® to quickly clean surfaces near the waterline. Add Pool Complete™ to your weekly maintenance routine to help keep surfaces cleaner.